Thrifting is one of those polarizing activities. Most either love it, or hate it. Find joy in the hunt, or can’t take the “old smell”. No matter where your stance is on the matter, you can’t ignore that there are some great deals to be had, and treasures to be unearthed. We are no experts, but it is fun! 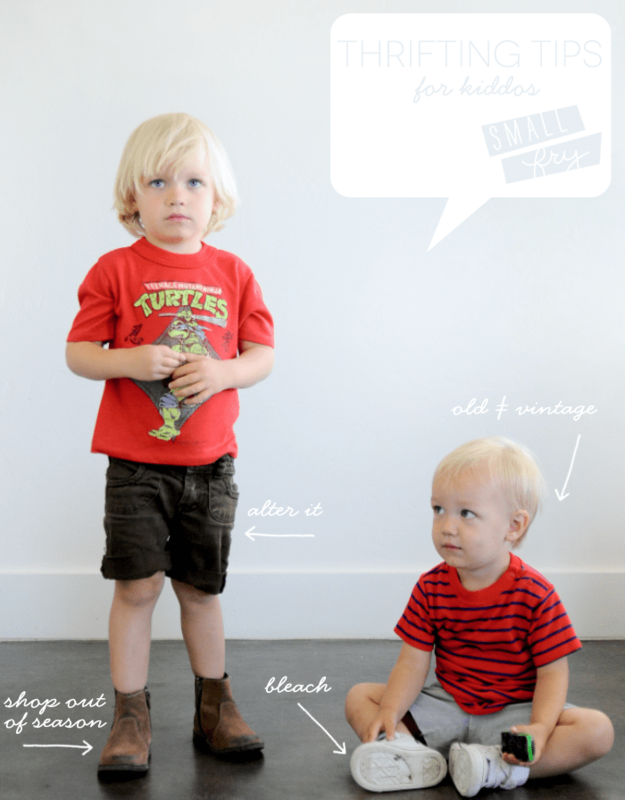 Here are our tips for thrifting for kids, things that have helped our hunt, and a little show and tell of two complete outfits that totaled $5 each. 1. There’s vintage and then there’s just old… Healthtex, Carter’s, and Rustler, are all brands that seem to age well. With big box stores’ unbeatable prices, thrifting isn’t always the best option if you’re short on cash anymore. So now, it’s all about finding those one-of-a-kind pieces, or those somehow never-been-worn gems that you won’t ever find down the mile long aisles at your local chain. 2. Shop out of season. You can usually guess what size your kiddo will be at any given time. So if you’re shopping in May, hunt for coats, jackets, snow suits, in the next size up. No one else is really looking for those things, and that is where the best finds usually come from. 3. Think outside the box. Easy alterations can turn outdated items fresh again. A super flared pair of brown trousers with embroidered flowers around the bottom cut off at the knee makes for darling cut-off shorts (see above.) Too short long sleeves seam-ripped at the shoulder make for great tank tops. 5. You can buy new shoelaces for $1. This seems obvious, but passing up some pretty cool shoes and boots just because their laces were worn out, or were simply the wrong look is an easy fix. This goes for girls and boys shoes, perfectly lovely brown suede boots with once glittery pink laces now look great for a boy with a new pair of neon and vice versa. We won’t even get started on the unbelievable pieces we’ve seen on our littlest girl friends: dresses, rompers, mary-jane leather shoes. We are pro-thrift, what about you? Any good tips to add, we’d love to hear! These are such good tips. May I suggest one more: leave your kids home while you thrift. There is nothing more horrifying than looking over and seeing your toddler crawling on an old mattress. Haha, I’m dying. So true! You girls clearly aren’t thrifting experts, but this is a topic many of us love. So thanks for the effort! It would have been so much better if you’d let another blogger do this post… someone with some serious thrifting skills!! Haha, thanks, I guess? I’m no expert, just have a love of the thrift. We’d love to hear your tips! On the contrary, I think it is great to have a “non-expert” give tips, since so often it seems like you need to be an expert to make it worthwhile … this post makes thrifting more accessible. 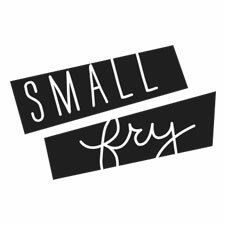 So, thanks, small fry! That is so nice Rebecca, thank you so much. Made my day, in fact. I love thrifting for my kids! I would say one tip- BE PICKY! Just because its cheap, people seem to buy it all, and end up with so much that they didn’t really want. We have a children’s consignment shop down the street and I go once a week, usually only leaving with one or two things. But SERIOUSLY cute things! You’re so right! I have so many items mostly for myself that I can’t remember why I bought it except that it was cheap. Thanks Ashlee! For girls, I have found some cute simple dress (vintage GAP searsucker, gingham overalls, Kelly’s Kids) for under $5 that when you add a monogram become one of a kind and adorable for under $20! I’ve just started changing shoelaces in shoes! For my daughter, I bought her a pair of thrifted boys baseball cleats…I made them girly by changing the shoelaces…she loved them! That’s a great tip that I’ve never see shared somewhere else! So smart! It seemed like the most obvious tip, but sometimes you forget to think outside the box! Haha it’s so true. It’s a lot of work, and I love your kind of shop for that very reason!! Most thrift stores have calendars and specials, so check with them before you leave! My favorite shop has $0.88 clothing day the last Friday of the month- it’s busy- but awesome!!! Your tips are all great and helpful! I’ve never considered the shoelace change out- brilliant! Awesome tip! Our thrift store has a calendar with specials and coupons, I always forget to pick one up. And $.88 each, AWESOME! Kids grow so quickly you have to thrift at some point! And it’s fun!! It is fun, totally agree! I think your thrifting tips are great and I thrift all the time lol!!! I did a post on my blog about how and why I thrift. http://lydiaburchett.blogspot.com/2011/03/wow-wednesday-thrifty-is-nifty.html My favorite thing about second hand clothing is that you immediately know how the fabric will wash and wear, if it is pilled or shrunk or faded you don’t buy it so what you do get will usually hold up. I love that I get one of a kind looks for my kid and I feel like I’m doing good in the world in addition to helping my budget. And if you are crafty, a larger item can often be sized down for a kid. I can buy a women’s skirt, cut it to make it my daughter’s and have enough scraps to make a matching outfit for her favorite doll! The Monday and Tuesday after yard sales (since it’s that time of year again) are great days to go. I feel yard sales allow for more bargaining and better deals, but you can’t hit every sale, so thrifting is a great alternative (especially during the yard sale “off season”)! I turned “Thrifting” into making a living. I don’t have a B&M shop but I hunt and gather and re-sell on ebay etc. IF you have a Sal Army nearby they have several specials on TAG COLORS–usually one color a DAY is half off. Around here Wed is the major day with everything BUT one color being half off–go early! Be aware tho that recently some have decided to have their workers “Cherry pick” and remove what they consider the “Good Stuff” to re-sell on their own web sites. For hugely OVER INFLATED PRICES–and the shipping! OMG their costs are insane. But their “name brands” are not always OUR name brands either. Grab everything you think you might want and find a quiet corner or dressing room and EXAMINE it ALL. Some are also using some sort of silver or white marker on the bottom of shoes–use a SHARPIE to cover this up. Also we have discovered that SOME colors NEVER go on the special–they are now marking bags and shoes and some clothing items this way. Then they go thru every once in a while and PULL all of these colors–seems like a LOT of make work to me—and either re-tag or get rid off ALL of this stuff. I like SA for SOME things–I get GREAT deals on things like leather jackets and some shoes and kids jeans and some kids clothing and of course the “New With Tags” items. KNOW THY BRANDS!!!! The Good Will is the WORST of the offenders on “Cherry picking”–I haven’t found anything remotely “good” for well over a year and don’t even go anymore. Look on their web site to see what people used to be able to buy in their stores! For smaller local thrifts make friends with the staff. They will often give you bundle deals or even save something for you. Unless something has a real “issue” that they missed don’t quibble over prices unless there is a serious marking problem–a pair of kids shorts marked at $20 lets say!! !—-as they are often supporting a charity and you are almost always paying a fraction of the retail cost even if the item was on clearance. Can you re-make the item? Can you store it til it IS in season? Will it work with the rest of your stuff? For things that won’t be worn often–can you re-sell it? And if you don’t WANT to do your own thrifting–or haven’t found that perfect little something–come see me ‘n’ my friends on EBAY and the other auction/re-sale sites. We don’t bite and will search FOR you! I too love finding gems at thrift stores! I’ve even found some clothes for my little ones that still have the tags on them! I also like the website thredUP.com they have some great items for great deals! And they have a discount code SIMPLESAGE35 that is 35% off and free shipping on your first order! Can’t beat that! Oh man, why have I never thought to bleach shoes before? This opens up a whole new can of worms. This is great because we can’t afford clothing anymore and the idea of watching them grow and needing to clothe our boys each year and each season scares my wallet, but this gives me hope to know that you bought all this for $10. I have had such great luck with thrifting! Some of my favorite pieces they own were a buck!